A five-metre bell tent in a prime position in Pete's Field @ Cole Farm with views across the Kent Downs - the perfect spot for watching the sunset. A picnic table, off-ground fire bowl and camping chairs are provided to help you make the most of the view. 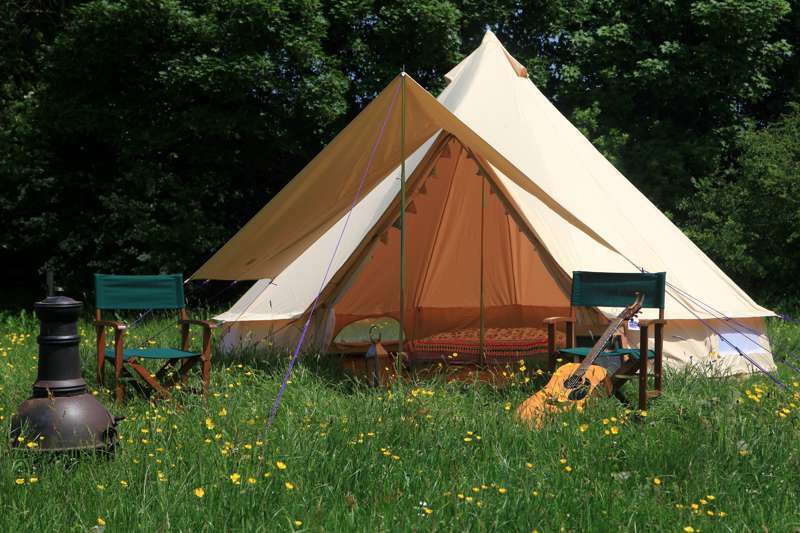 The bell tent is set up and simply furnished for a comfortable camping stay with coir carpet, a double mattress on a futon base, two fold-out mattresses for kids or extra adults. A box of cooking utensils are provided, suitable for use on the fire, along with plates and cutlery. One of three bell tents on site at Pete's Field pop-up campsite, you'll have plenty of space to relax and unwind and use of our simple on-site facilities which include flushing toilets, bucket showers and an open-air washing up area.